Wang Lei（王 雷）／It's time to say goodbye! Six months have past since I came to Sapporo and I will come back to Xian in two days. It’s time to have a brief summary about my study at Sapporo Institute of Dermatopathology. 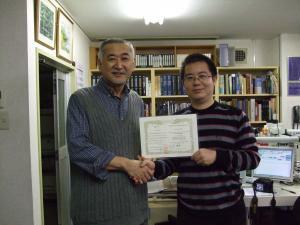 During this half year I have read more than 20, 000 slides under the direction of Dr. Kimura. This is the gold time for me to promote my diagnose skills of dermatopathology. I have seen thousands of difficult or rare cases during the training time. Through reading slides under microscope and discussion with Dr. Kimura, I have expanded my knowledge and promoted my diagnose skills prominently. I had chances to participate Hokkaido dermatology meeting in Asahikawa, Japanese dermatopathology meeting and A Bernard Ackerman Memory Ceremony in Tokyo, and dermatopathology seminar in Kobe. Through these meetings and seminars I not only enriched my knowledge of dermatology, but also appreciated the professional spirit from our Japanese colleagues. I also got chance to participate the CPC session in Department of Dermatology and Pathology of Hokkaido University every week and to communicate with Professor Shimuzu and Professor Matsuno. I am honored to have given a speech at Department of Dermatology of Hokkaido University. In October I met Professor Zhu Xuejun, one of the most respected Chinese professor of Dermatology in Sapporo. In the August my wife came to Sapporo and we spend one month together in Sapporo. During that time we visited Shiretoko, Otaru and Hakodate together and walked through streets, shops and parks in Sapporo. We enjoyed the beautiful sceneries of Hokkaido and the warm hospitality of Hokkaido people. In this half year I really harvested a lot in Sapporo Dermatopathology Institute and enjoyed my life in Sapporo. I would like to thank my teacher, Dr. Kimura, for supporting me to study at Sapporo and teaching me dermatopathology in the style of Bernie Ackerman. One of the famous Chinese old saying have said: the teach opens the door, you enter by yourself”. Dr. Kimura opened a door for me and taught me dermatopathology, now it’s time for me to work hard in the field of dermatopathology and to get achievements. I would like to thank the staff members of Sapporo Dermatopathology Institute for giving me a lot of helps and convenience during my staying in Sapporo. I would also like to thank friends from Japan Dermatopathology Promotion Organization for supporting me financially. I would like to thank Professor Shimuzu, Professor Matsuno and friends from both departments for giving me a lot of helps during my study and visit in their departments. This month I had participated the dermatopathology teaching course in Kobe. The teachers included Dr. Kimura, Dr. Fukumoto and Dr. Ansai. The course was well organized and the lectures were given both in width and depth and were attractive to the attendees and me. The most important is I learned a lot about how to organize a dermatopathology teaching course and will use the method in the near future. In the two days I had chance to communicate with Dr. Fukumoto and Dr. Ansai and made friends with them. I was also excited to have met Professor Zhu Xuejun from Peking University. He is a highly respected professor of dermatology and dermatopathology in China, and also an old friend of Dr. Kimura and Professor Shimuzu. We visited Otaru together but unfortunate it was rain in that day. However it’s a good opportunity to talk with him in the tea house. This month I was also highly effective. I completed two drafts about my research projects. In each project I tried to explore the pathogenesis of the disease through historical literature review. I drew conclusions different from others. Dr. Kimura supported me to do the research and helped me to collect samples. The life in Sapporo is just simple for me. I hope I will be greatly improved in this half year. There were several things to be recorded in the fourth month of my staying in Sapporo dermatopathology institute. The first thing is my first research paper has almost been finished. The research result was exciting to us and the conclusion was a brand new one. This work is my original idea and we hope it will be published in American Journal of Dermatopathology. The second thing is I have finished reading a lot of classic dermatopathology books in the institute, including Professor Ackerman’s classic books, dermatopathology journals of recent years and other English and Japanese books. I knew both theories and practice are important for my promotion. The books represented the theories and the daily work under the microscope represented the practice. So I need to get prove in both aspects. The third thing is my wife has come to Sapporo with the kind help of Dr. Kimura. In the weekends we visited Shiretoko, Otaru, Shiretoko and Sapporo. This is the happiest time of us.